The Green Party has selected its candidate for the Buckingham constituency in the general election. Alan Francis has lived and worked in the north Bucks/Milton Keynes area for over 30 years. He was research fellow for computer graphics at the Open University and has been a transport consultant. Mr Francis has been a Green Party candidate for Milton Keynes in previous general elections and chaired the party’s National Executive Committee for two years. He has been chairman of New Bradwell Parish Council, Milton Keynes Forum, MK Transport Partnership and MK Rail Users Group. 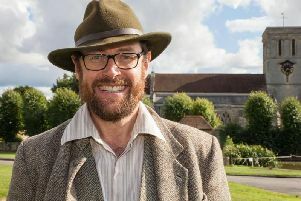 Mr Francis has campaigned for the East West Rail Link, which will put Winslow back on the rail network, and has opposed large-scale housing developments on greenfield sites such as Salden Chase, near Newton Longville. Mr Francis said, “I am delighted to be selected as the Green Party candidate for Buckingham. “The Green Party is experiencing a surge of support this year. “The Buckingham constituency is unique in that Labour and Liberal Democrat parties will not be putting up candidates because the sitting Tory MP is the Speaker. “Voters have become disenchanted with the three big parties. Green Party policies include bringing the railways back into public ownership, scrapping university tuition fees, keeping the NHS in public hands, halting the austerity cuts and taking action on climate change to protect the planet.